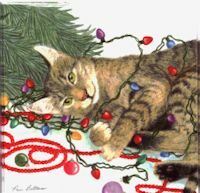 This package of Christmas cat gift enclosure cards features a cat "helping" with the Christmas lights under a Christmas tree. There are six blank gift enclosure cards and six envelopes in each package. The gift enclosure cards are 3" square. The cards are printed in the USA on paper from responsibly managed forests.